Well im back from Normandy and what can I say but WOW! First of all I’d like to say that the area itself is beautiful and serene, fitting considering the blood spilt on its soil. The people are very friendly and the vast amount of French, British, American and Canadian flags all over the small villages are testament to the sacrifices made and the gratitude is obvious in the amount of streets named after soldiers, regiments, divisions or the Liberation. The cuisine and its drink, vive le Calvados et cidre, are also top notch. I have taken over 1,300 photos, my wife cannot believe it and I will put the best ones here in this thread over the coming days/weeks. We took in Pegasus Bridge, Merville Battery, Gold, Juno, Sword, Omaha and Utah Beaches. The villages and towns between them. Longues sur Mer Battery, St Marcouf Battery, Douvres Radar Station Maisy Battery, St Mere Eglise, St Marie du Mont, Carentan, Caen and Bayeux. The list of Museums and bunkers is endless. Holt’s battlefield guide proved an invaluable resource especially the longitude and latitude bearings for the GPS. Hiring a car is essential to get around the beach and battle areas. The driving through the country lanes and the discovery of quaint villages like Douvres la Deliverand and Beauvron en Auges just add to the experience. I was also lucky enough to sit down and chat to a veteran at Arromanches les Bains. Mr H.Billinge, a Royal Engineer attached to 47 (RM) Commando. He was there raising funds for the Normandy Veterans Association (NVA) and it was an honour to hear him speak and an even greater one for him to accept the beer I bought for him! Yet the most poignant visits were the ones to the cemeteries. We took in the British ones at Ranville and Bayeux. The American one at Coleville. The Canadian one near Beny Sur mer and ofcourse La Cambe. It is overwhelming to see so many soldiers lying at rest overlooking the places they fought over. Overwhelming as well the vast amount of respect one senses when you enter these places. All were immaculate and well cared for and it brought a tear to the eye to see so many Germans resting under the mighty oaks at La Cambe. Impressive as well the Canadian flag at the car park of the Beny cemetery. May their souls rest in the eternal peace these warriors deserve. 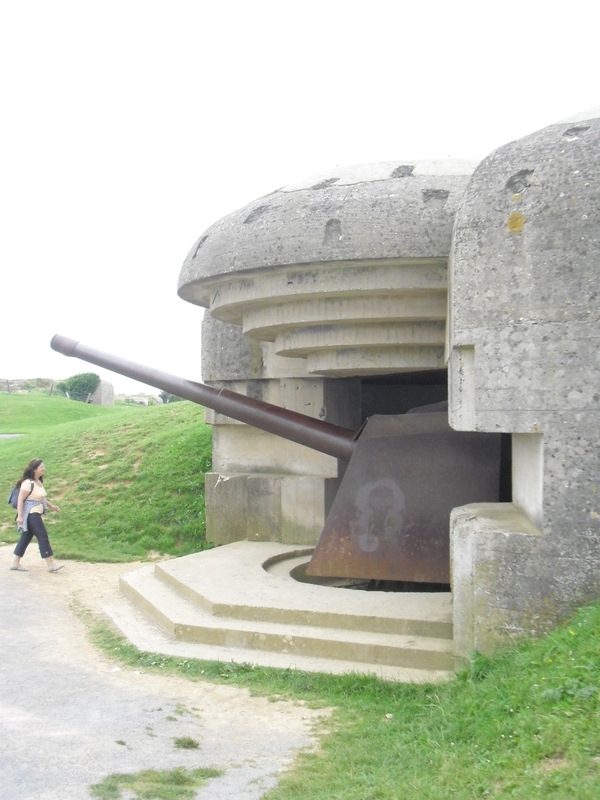 Here is one pic from Longues Sur Mer to wet your appetite. Panoramic view of the Mulberry Harbour remians taken from outside the 360 Cinema which is on a hill overlooking this beautiful and emotive village. We’ve been exploring the Juno Beach and Canadian sectors today. Great visit to the Juno Beach Centre, Radar Musee at Douvres as well as a walk through the beautiful Douvres la Deliverande. Hitting Gold Beach sector tomorrow. Their names shall liveth ever more. A picture of the range finder at the top of the Grand Bunker (17metrers). Fantastic view down Sword Beach and a very educational museum as well. Panoramic view, though i am posting it from my mobile so i have no idea how it will post. Right on Sword Beach we have this great looking memorial to the men of Cdt Kieffer, Free French Commandos of No 4 Commando. The first Frenchmen to land in France on D-Day. A but further down the sea front in Lion sur Mer we have a series of memorials to the 3rd British Division.